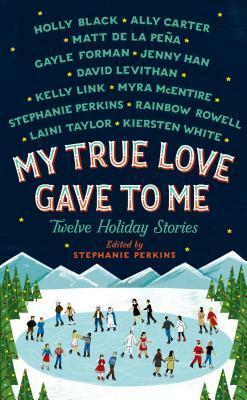 If you love holiday stories, holiday movies, made-for-TV-holiday specials, holiday episodes of your favorite sitcoms and, especially, if you love holiday anthologies, you're going to fall in love with "My True Love Gave to Me" Twelve Holiday Stories by twelve bestselling young adult writers (Holly Black, Ally Carter, Matt de La Pena, Gayle Forman, Jenny Han, David Levithan, Kelly Link, Myra McEntire, Rainbow Rowell, Stephanie Perkins, Laini Tayler and Kiersten White), edited by the international bestselling Stephanie Perkins. Whether you celebrate Christmas or Hanukkah, Winter Solstice or Kwanzaa, there's something here for everyone. So curl up by the fireplace and get cozy. You have twelve reasons this season to stay indoors and fall in love." "Stunning and diverse, this holiday anthology is pure magic. This is what all anthologies should aspire to be." --RT Book Review, 4.5 stars, "Top Pick"
STEPHANIE PERKINS has always worked with books first as a bookseller, then as a librarian, and now as a novelist. She's the author of the international bestsellers "Anna and the French Kiss" and "Lola and the Boy Next Door," as well as "Isla and the Happily Ever After." "My True Love Gave to Me: Twelve Holiday Stories" is her first anthology. Stephanie and her husband live in the mountains of North Carolina."